"You can't be in M9 and have a private life, you know." 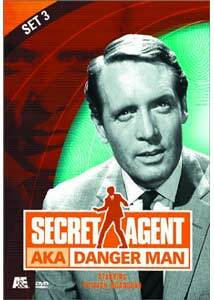 Patrick McGoohan took a couple of stabs at portraying secret agent John Drake, first in a half-hour series called Danger Man that ran for 39 episodes in 1960-61. The show was resurrected under the same title for two seasons, beginning in 1964, in hour-long episodes. It is the first of these latter two seasons that comes to DVD courtesy of A&E. Eight episodes from that second season are presented here in their original broadcast order in the US under the name Secret Agent. However, the original British titles (without the classic Johnny Rivers Secret Agent Man theme song that introduced the series in the US) featuring a bullseye target design and a nifty harpsichord theme. John Drake is an agent for M9, the TV equivalent of MI5, which has its headquarters disguised as World Travel in the shadow of St. Paul's. Arguably, Drake appeared again as Number 6 in The Prisoner, based on the numerous hints and parallels, though McGoohan has always denied this (but for legal reasons can probably hardly do otherwise). Ratings are out of maximum 5 targets. When some vital documents turn up missing, a single fingerprint points to Jock Lawson, a man who vanished shortly after World War II. The trail leads Drake to an isolated island in the Hebrides. Drake must find out what the connection is to a number of Russian fishermen who are surreptitiously landing on the island. This is a pretty good story, with an intriguing setting that makes the most of the insular character of the Hebrides, and also takes a vicious stab at bureaucratic incompetence. In the wake of an attack on an African diplomat, Drake goes undercover and masquerades as a prisoner, Bowden, who enters into a mysterious school for assassins. There's good suspense generated as Drake prowls about, but it's quite unclear how he manages to keep slipping out from under surveillance without attracting suspicion, forming one of the weakest points. Keep an eye out for Bond girl Martine Beswick as a party girl brought in to entertain the killers. Drake poses as Inspector Grant of Scotland Yard while in a Caribbean nation. There he investigates the murder of two M9 agents, whose wives seems to have been having affairs with the same Don Juan. Is it a lover's quarrel, or something more sinister? There's decent use of the voodoo background here, but the best part is the writing. The episode is chockfull of snappy dialogue that makes it quite entertaining. Once again in Latin America, Drake attempts to fend off the execution of an old revolutionary, Ramon Torres (Harold Goldblatt), under charges of a massacre that took place 25 years earlier. Drake is at odds with an American agent, Kemp (Charles Tingwell), who is willing to use violence to break Torres free. Drake instead pursues a more subtle method which leads him to a silent film cameraman (Eric Pohlmann) and into a series of bold bluffs and twists. Competently done, with a few Bondlike episodes, but really just pedestrian spy stuff. A highlight is Aubrey Morris as Fortunato Santos, a bumbling comic police spy outwitted by Drake at every turn. Drake: Someone's really boobed on this one, haven't they? Gorton: Yes, Drake, that's why you're here. Apply that friendly charm of yours and we'll see where that gets us. Drake is visibly perturbed by the incompetence of M9 that surrounds him, and it rather gets the better of him in this episode. So determined is he that he knows better how to run an investigation that he lets the suspect have a bit too much rope and they lose the trail—and some British naval secrets to boot. The episode features Drake masquerading as a timorous schoolteacher with a fondness for Bach records as he cosies up to suspect Dennis Rawson (John Fraser). McGoohan definitely has fun with the character and there's some interesting cat and mouse play here. A highly entertaining episode. After crashing his car, Drake finds himself in an increasingly disorienting situation involving a casino that claims to be owed £500 by him—though he doesn't gamble. Did something happen while Drake was out? How did the manager of the casino, Alexander (Francis de Wolff) learn about Drake's cover? And why does Mr. Lovegrove (Eric Barker) keep popping up in the most unlikely places? This is a highly surreal and amusing episode despite a predictable ending. Especially notable are the numerous jabs at the 007 films here, including the casting of Q (Desmond Llewellyn) as the sinister doorman of the casino, as well as the movie tie-in paperback of From Russia With Love that Drake is reading. There's a ton of witty dialogue here and the episode is great fun from beginning to end. Drake finds himself in French wine country as a blackmailed young woman, Kathleen Martin (Kathleen Breck) is delivering microdots to an agent of the opposition. When Drake intervenes, Martin turns up dead and he finds himself on the run from the French secret service and the French police. The plot is wild and convoluted, but it's nice to see Drake in this slightly offbeat situation, forced to deal with an impossible situation with only his wits and no possibility of assistance. You're Not in Any Trouble, Are You? The final episode in the set is in fact the first episode of the third season (oddly enough, it aired in the US before airing in Britain). British agent Ellis (Jeremy Burnham) is thrown out of a window of a Roman hotel, and Drake finds that he has to put out a contract on his own life to catch the killer. A first-rate episode, with healthy comic relief from Lena (Susan Hampshire), who keeps getting in Drake's way and inadvertently saving his life. There's an over-reliance on coincidence, however, that ultimately detracts from the final grade. But it's still better than most television today. Look for Burt Kwouk (best known as Cato from the Pink Panther series, and fresh off an appearance in Goldfinger, to add another Bond tie) as a killer for hire. Image Transfer Review: The video is presented in its original full-frame aspect. Shot on film, the picture is detailed and clear, with generally attractive black and white photography. A few sequences are overly dark, but by and large it's quite good, with deep blacks and a wide range of greys. A few speckles and bits of damage are noted (notably worse in the stock footage), but this looks miles ahead of The Avengers from the same period that exist only in kinescopes. Unlike the first volume, edge enhancement or compression ringing is visible on contrasting vertical lines. Audio Transfer Review: The sound is an adequate 2.0 mono. There is some hiss and crackle that generally isn't too bad, but it's fairly significant on the last two episodes. Many episodes have a spotty burring sound under dialogue but overall the audio is clear and easily followed. The harpsichord theme comes through delightfully well. Extras Review: Those longing for the Johnny Rivers theme music don't need to worry; the crudely animated US opening is presented here as an extra (it also provides the lead-in to the main menu). A two-screen bio of McGoohan, plus a fairly extensive filmography are included. All of these extras appear on both discs. Wrapping up the package are photos, with a little more generous sampling of 5 per episode. These are presented slightly windowboxed, but they do occupy most of the screen, which is a major improvement for the A&E television releases. Chaptering is a marginally adequate 6 stops per episode, roughly corresponding to the commercial breaks. Eight episodes from 1964-65, given a very nice transfer. Some of the episodes have some significant background hiss. A little lacking, as usual, in extras, but definitely worthwhile for fans of spy tales. The programs hold up quite well even nearly 40 years later, despite being grounded firmly in the Cold War and the death throes of the Empire.